The fatal shooting of a dog by Hawthorne police officers in California last Sunday is the most recent meme to feed our national need to be outraged. The video, which has already garnered over 2 million views, shows the death of an 80-pound Rottweiler in graphic, shocking detail, though not much else in terms of context. In the time that it took for the full story to come out, readers, viewers, and journalists around the world provided their own context, and their own reasons for why this must have happened, drawing from the stock-narratives of police brutality, racism, and gun violence our culture has accumulated over the years. Though America has never been safer and less violent, how this story was treated shows us how our cultural memories and national anxieties define how we see ourselves. If we can, let’s start with just the facts. On June 30, officers from the Hawthorne Police Department responded to reports of an armed burglary at 137th and Jefferson, and a 2-hour standoff ensued. Officers blockaded the residence and began negotiating with the suspects through loudspeaker, and soon the heavy police presence drew a handful of neighbors and bystanders to watch, some even recording the standoff on their phones. Halfway through the disturbance, Leon Rosby, 52, arrived at the scene, parking his car on the same block as where the standoff was taking place and blasting Usher’s “Tell Me Again” from his car speakers. With the music still playing, Rosby and his Rottweiler left the car, camera phone also in hand, and approached within close proximity of the engaged officers. The video picks up after the standoff had concluded and the burglary suspects arrested. Police officers approached Rosby to arrest him for disrupting their operations, telling him as they came near to put his dog away in his car, which Rosby did before immediately submitting to arrest. While officers were handcuffing him, Rosby’s dog jumped out of the car and ran towards the officers. One officer, weapon drawn, repeatedly attempted to grab the Rottweiler by the collar before it cocked back to attack. When the dog charged, the officer caught him mid-lunge, discharging four rounds. 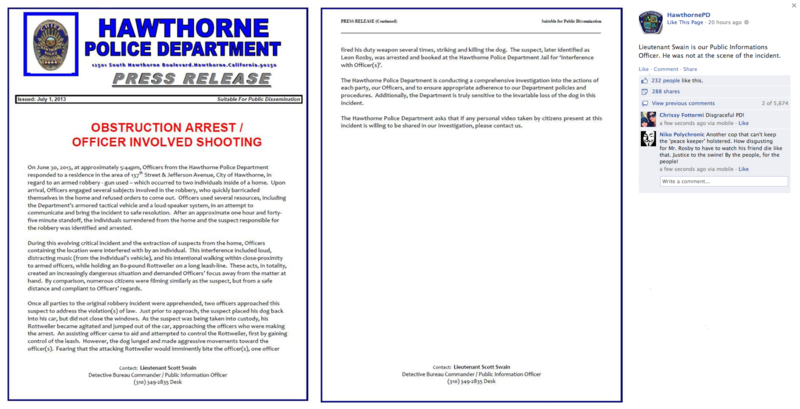 The Hawthorne Police Department, unsurprisingly, tells a starkly different story. Rosby, for reasons unknown to any but himself, exceeded the bounds of natural curiosity by disrupting a critical and dangerous police operation. Through a combination of loud music, his Rottweiler, and sheer physical intrusion, Rosby “created an increasingly dangerous situation and distracted Officers’ focus away from the matter at hand.” Legally, this is ample justification for Rosby’s arrest, and, though the police department is “truly sensitive to the invariable loss of the dog,” in that case the officers were acting in self-defense. Almost invariably, the former is the interpretation that you will run into most on the internet. The internet’s comment-class is demanding everything from monetary restitution for the victims to the firing of all officers involved (you can sign the petition here). Despite the fact that none of the other bystanders who were filming the police were arrested, the internet is in near-unanimous agreement that Leon Rosby was arrested for filming police and nothing more, being merely the most recent victim of the Patriot Act, racism, the authoritarian state, and anything else you can think of. It can be difficult to find the symptoms or evidence of our national anxieties. The statistics tell us that we are safer than we’ve ever been, that our wars are far less destructive, that race relations enjoy a détente, that civil rights are marching on. Yet still, conspiracy theories have never been more rampant, our civil institutions never weaker. It is seen as naïve in the extreme to trust your government, your newspaper, or your neighbor. We can see this every time a new tragedy breaks, every time the 24-hour news cycle invites us to join the victims, when, in the first few hours or days of ignorance, we tell each other what we really think.